December 28, 2018 – New Yorker Electronics will now be distributing the Vishay Dale IHLE-5A Series of Low-Profile, High-Current Power Inductors – a Vishay Super 12 Featured Product. The IHLE-5A Series is an automotive-grade, high-current inductor featuring an integrated e-field shield, or “e-shield”, for reduction of EMI. 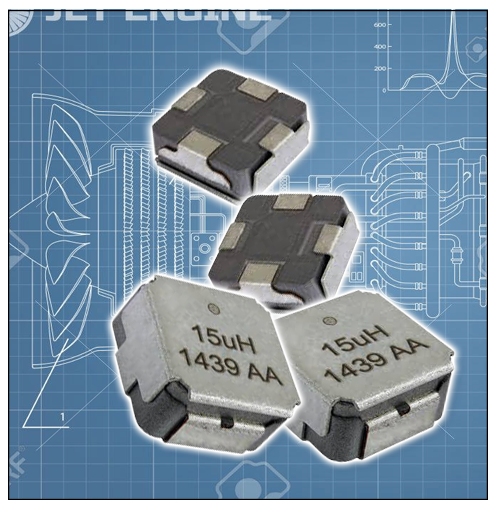 Vishay expanded its IHLE series of low-profile, high-current inductors with these new Automotive Grade devices in the 2525, 3232 and 4040 case sizes. Packaged in RoHS-compliant, 100% lead (Pb)-free shielded construction, the inductors offer high resistance to thermal shock, moisture, mechanical shock and vibration. The Vishay Dale IHLE-2525CD-5A, IHLE-3232DD-5A and IHLE-4040DD-5A reduce costs and save board space by eliminating the need for separate board-level Faraday shielding. Built on Vishay’s IHLP® technology, they feature high efficiency with maximum DCR from 1.66mΩ to 178mΩ and a wide range of inductance values from 0.47µH to 47µH. The Vishay Dale IHLE Series contains the electric field associated with EMI in a tin-plated copper integrated shield, providing up to -20 dB of electric field reduction at 1 cm (above the center of the inductor) when the integrated shield is connected to ground. The four-terminal connection (two ground connection points for the shield) provides extra vibration performance for under-the-hood and chassis-mounted electronic circuits. The device provides rated currents to 30A, and handles high transient current spikes without saturation. Featuring high-temperature operation to +155°C and co-planarity of its four terminals of ≤100µm, this AEC-Q200-qualified high current inductor is optimized for energy storage in DC/DC converters and high-current filtering for automotive engine and transmission control units, diesel injection drivers, noise suppression for motors, windshield wipers, power mirrors and seats and HID lighting. New Yorker Electronics is a franchise distributor for Vishay Dale and carries the full line of 2017 Vishay Super 12 Featured Products as well as its complete line of discrete semiconductors (diodes, MOSFETs and infrared optoelectronics) and passive electronic components (resistors, inductors and capacitors).